That moment when you are handed the keys to the first home you’ve ever bought, that you saved up for tirelessly over years of socking away paycheck after paycheck, that you dreamed of so many times, a place of comfort and shelter for you and your family—pure joy and accomplishment flow through your blood. Three months ago Christina Block, a friend of mine since high school, knew that feeling with no amount of uncertainty. The charming blue-grey bungalow with the bright yellow front door, nestled cozily in Jacksonville’s historic San Marco neighborhood, was now hers, along with the pride of homeownership—not to mention the contentment of having a place that she and Asher could call their own. Now enter Irma stage left. Last Monday morning Irma put on a show that Jacksonville could have done without. She delivered a deluge of unprecedented proportions to our area that attempted to unravel the fabric of our community. And it’s darn hard not to become unraveled in times like these. Houses underwater, businesses devastated, serenity uprooted and thrown out to the curb. But Jacksonvillians won’t be undone so easily. Neighbors exhaust themselves for neighbors, generosity travels unmapped and unlikely routes, and cleanup efforts move forward with gusto, despite the mountain that is in front of us. This is what we do in Duval. This is how we roll. And this…this is Christina’s story. Bold City Voice: You didn’t ride out the storm at home, correct? 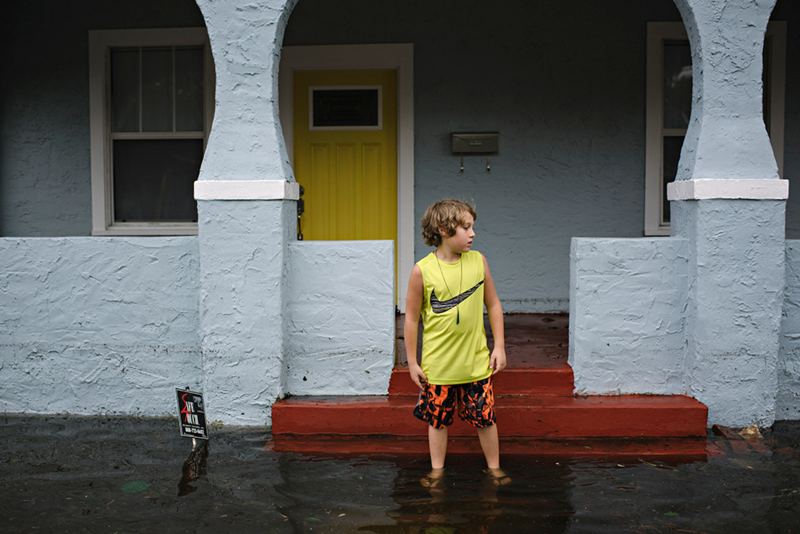 Christina Block: Thankfully no, our home in San Marco is in zone A, so once the evacuation zone was ordered, we packed up a few things and went to stay with my mom. BCV: What was your reaction when you saw your house? Were you in a boat when you saw it? CB: The morning after Hurricane Irma came through I waited for the wind gusts to die down, then got into my car to head over to San Marco. At this point they were asking everyone to stay home, but I just had to know if our home was damaged. This isn’t just any home, it was our first home. I am a single mother and over the years we have been renting, but my goal was to get enough money saved so that I could buy a home for Asher (my son, 10) and myself. We ended up finding the perfect home in the exact location we wanted to be in—I felt like it was 100% meant for us. I just bought the home a few months ago, and we haven’t even unpacked everything yet. We still had a few things to finish in order to make it a home. Anyhow, back to the day after. 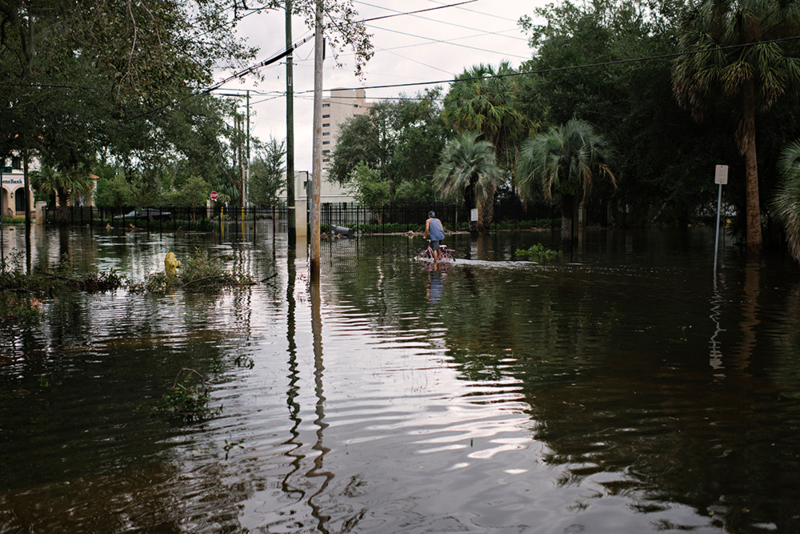 That afternoon when I pulled into San Marco it was still completely flooded. I tried to get as close as I could to our street but JSO had many streets blocked off. I wanted to park somewhere & walk to our home but since high tide was due soon, I figured that was probably not a smart decision. Later that evening I headed back to San Marco after high tide passed. This time I parked and was able to walk to my home. The water was still about waist high but I had to see if the inside of our home flooded. BCV: What was the damage toll to your house? CB: The entire inside of our home flooded—every inch of every room was under water. I was able to see water marks on the walls and it looked like it got up to about 3 feet. My A/C is completely fried, all the flooring & subflooring is ruined, half of our drywall has to be cut out. Doors, cabinets, base boards all have to be replaced as well. We also have a newly built shed in the back yard that flooded inside as well. I honestly don’t know the extent of the damage right now because I have just started the after-storm process. All of our floors are unleveled now, so I have no idea if there is more damage under the home. BCV: How is your heart dealing with it all? CB: In all honesty, the first few days after the storm I had been running off adrenaline. Post hurricane, day 2 or 3, I had a good group of people helping me at the house. I had a friend drop off drinks, two friends bring fans and a generator, and then a few friends helped me get all the ruined goods to the curb and whatever could be salvaged into a small U-Haul. I had left everyone at the house while I registered at the FEMA van in San Marco, and when I came back one of my friends handed me $100. He told me that a lady and her children drove by my house and that she was visibly distraught…she said it wasn’t much but she wanted to help. Once I heard that I just broke down. I think that’s when reality set in. Not because I had lost these things, but because an actual stranger gave me a gift from the heart and that just meant so much. Never in a million years did I think I would be on the other side of giving—and there I was, the one needing to be lifted up. That was, and still is, really hard for me to accept. It was just a hard day, seeing all the furniture I just bought being trashed, some of which I am still making payments on…that just felt really heavy to me. Day 3 and 4 weighed heavy on my heart as well—letters, photographs, ornaments (that I have had since I was a kid), my son’s artwork and baby stuff—it was all ruined. Things you can replace, but things like this are irreplaceable. I will say this though, yesterday when I was driving back to San Marco to get some more work done, I had a long talk with God. I talked to him about many things…but I also thanked him. I was reminded how there is beauty in tragedy. So many people have lost, and lost a lot, but I have also seen so many people love and give so genuinely through this. I can honestly say, if it wasn’t for everyone lifting me up over the past few days, I wouldn’t have made it. I am beyond thankful for God, and for Him bringing such beautiful people into my life during this journey…I just don’t know where I would be if I didn’t have that unconditional love. BCV: How about your son, Asher, how is he handling it? CB: He has been amazing, not once has he complained or gotten mad that he had to throw away so many things. He literally lost about 70% of his stuff, most of which he’s been collecting for years and years. Items that he was so proud to have are now laying in trash bags by the curb, which just broke my heart for him. I sat him down the other day to tell him how proud I was of him, that he was so strong and had such a beautiful heart. I think it’s important that he wasn’t at the home during everything…a kid shouldn’t have to see that. Asher is definitely a trooper. 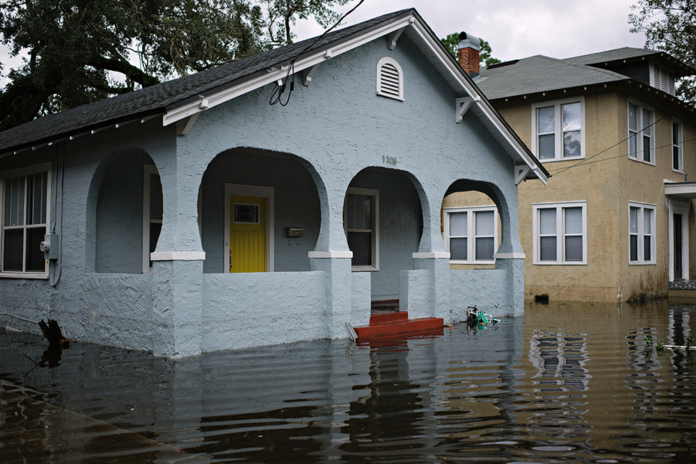 BCV: Do you have flood insurance, and can you speak about what they may be able to help you with? CB: Yes, thankfully I have flood insurance. I was actually required to get it when I purchased my home. Looking back, that was a blessing because I probably wouldn’t have gotten it otherwise. Honestly, I am not sure what they will provide yet. I will be meeting with my adjuster this Tuesday, and then I’m sure I’ll find out what they cover versus what they don’t. CB: Yes, they actually had a FEMA center in San Marco, and I have registered with them. For now they have offered to help with a hotel room, but fortunately my mom opened up her home to us, so we will be staying with her until everything gets worked out. I think the benefits coming from FEMA depend on your salary, your losses and other factors. Not really certain on how the entire FEMA process works. Every day I learn something new. I also learned that the flood adjuster visiting me this Tuesday is directly with FEMA. Again, just a little bewildered on how everything works. BCV: If people want to help (people near, people far) what can they do? CB: Thankfully I had a friend set up a fund account for Asher and myself, and the monies will be used directly to fix what we need to fix now. For instance, the A/C unit has to be fixed soon so that we can continue getting the home dried out for when the demolition starts. We also have used some of the funds already to replace items that Asher needed for school and baseball. I had a dear friend send me $50 yesterday and we used that to buy him new cleats—his were ruined from the flooding. If you want to help people that have suffered loss due to Hurricane Irma, I would suggest looking for friends who have been personally impacted, see if they have a fund account set up where you can donate and leave some words of encouragement. The big organizations do a lot with the donations they receive, but many times we have no idea where the money is being used. This way if you give to someone or a family that is personally hurting, you can see first-hand what your giving is helping to do. I have had many people offer furniture and goods for the house, which is incredibly kind, but before we could use any of that we have to work on rebuilding our home, the actual structure. And since so many people are struggling themselves, even just sending someone a letter of encouragement would mean a lot to so many. If you are able and willing to help, I just think helping a family personally is the best route to go. This way you can see the fruits of giving, follow their story, and make a place in their heart. All photos taken by Christina. Next articleWhy Would a Loving God Allow Disasters? Matthew Morgan is the Editor of Bold City Voice, the Jacksonville division of One Christian Voice, LLC. A lifetime resident of Jacksonville, Matt also works as a cook in addition to dabbling in the business of photography and videography. Above all, Matt finds immense pleasure in working alongside the Lord in whatever manner possible. You can check out his camera work at kingdomfilm.net.